Nabralift tower technology has been awarded the Eolo Innovation Prize 2018. This prize, awarded by AEE on the occasion of World Wind Day, will be delivered on June 26 at the Dinner of the Sector of the IV Spanish Wind Congress. The jury of the Eolo Innovation Prize 2018 has considered that the Nabralift project deals with a current technological issue in the wind market, such as the demand for high towers by the new generation of wind turbines, in order to exploit the areas with resources of low winds and maintain the production of energy and the profitability of the wind farms. The new Nabralift tower technology consists of a three-column structure integrated under a conventional tubular tower, which allows reaching high hub heights (between 120 and 200m) with an installation process that eliminates large cranes. Nowadays, there are technical barriers and costs associated with the manufacture, transportation, installation and maintenance of these towers. The Nabralift technology will allow breaking the existing barriers in the current wind market to continue advancing in height growth and allows reducing the total cost of the tower between 15 and 30%. The first tower prototype, destined to internal tests within Nabrawind, will be completed in the first half of 2018. This prototype will have a height of 160m, becoming the second highest wind turbine tower in the world, and will be submitted during the second half from 2018 to a new fatigue test where controlled loads will be generated to simulate 25 years of operation in an accelerated manner. The first deliveries of commercial towers will be made at the beginning of 2020. The initiative of the Eolo Innovation Award is framed within the lines of action of AEE and the technological platform of the wind sector, REOLTEC, to support innovation and national technological development in a context of strong international competition, globalization of markets and optimization of costs. 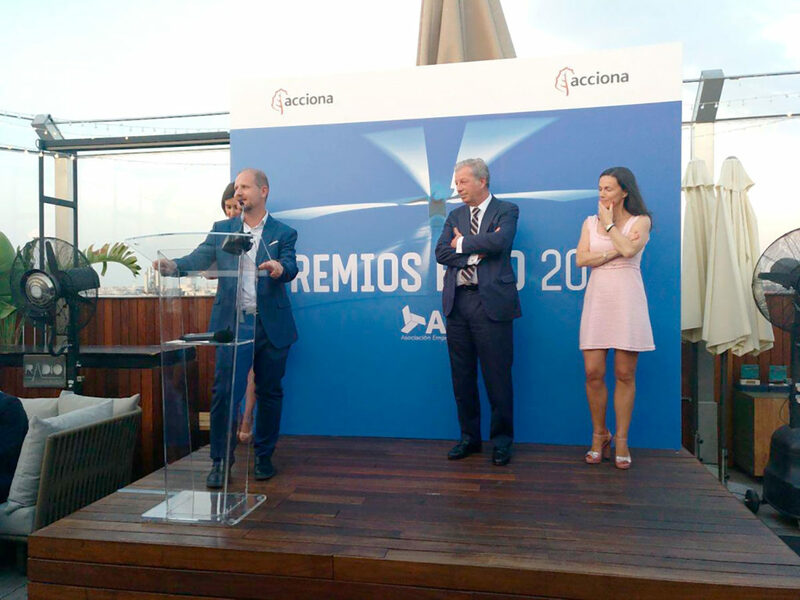 The award of this Eolo Prize will take place on June 26 during the Dinner of the Wind Sector, one of the main events of the IV Spanish Wind Congress that AEE celebrates that day. In this same event, which will be attended by a broad representation of the Administration, along with parliamentarians and the heads of companies and entities of the sector, will also be awarded the Annual Award to the Basque Government, the Eolo Photography Prize, the Eolo Prize to the Rural integration of the wind that this year has fallen to the Commonwealth of Southeast of Gran Canaria, and the award to the Country Invited to the Wind Congress that this year is for India. The IV Wind Congress, has the VIP sponsorship of Siemens Gamesa, Vestas, EDPR, Endesa, Iberdrola, Viesgo and DNV GL; and the collaboration of Acciona, as sponsor of the Sector Dinner, and of Enercon, Gas Natural Fenosa, Schaeffler, Senvion and UL International.